Distributors are ranked by number of tankers compiled from data supplied to Fuel Oil News by the relevant companies in January 2018. Source: Fuel Oil News February 2018. The top 10 lists for Northern Ireland and the Republic of Ireland are based on tanker fleet size. Figures, taken on trust, were provided in January/February 2018. Figures marked with an * are 2016. As a result of recent changes in their operation Topaz Energy and Top Kelly Fuels are no longer in the top 10. The companies in =9th position are new entrants. Fuel Oil News respects the wishes of some distributors who chose not to disclose figures. 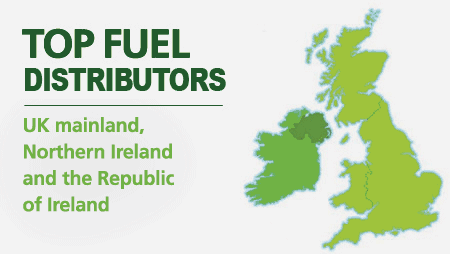 Based on 2010 figures Nicholl Fuel Oils remains in the Northern Ireland top 10. Source: Fuel Oil News March 2017. The list of the top 10 UK fuel logistics companies is based on size of tanker fleet. Figures, which were taken on trust, were provided by the individual companies. Source: Fuel Oil News August 2018.